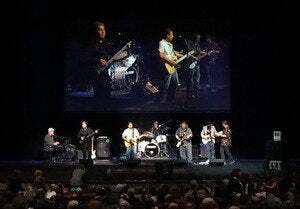 The Macworld Live band provided pre-show entertainment. 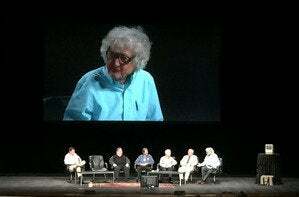 In a panel moderated by New York Times senior writer John Markoff, Daniel Kottke, Rod Holt, Marc LeBrun, Jerry Manock, and Larry Tesler talked about the very early days of the Mac development. Mac engineer Rod Holt was part of the first panel that talked about the very early stages of Mac development. The second panel moderated by Wired’s Steven Levy. It was filled with tales of the Mac from some of the people who made it: Bill Atkinson, Steve Capps, George Crow, Andy Hertzfeld, Bruce Horn, Caroline Rose, and Randy Wigginton. 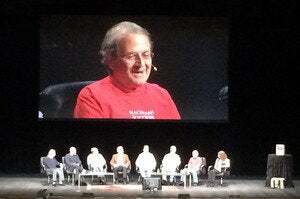 Andy Hertzfeld speaks at a panel of original Mac team members at the Mac 30th Celebration. Many of the stories told by the members of the second panel are familiar to die-hard Mac fans. Capps told the story of the pirate flag, Crow told the story behind the Mac’s floppy disk drive, Hertzfeld talked about how Jobs didn’t want cursor keys on the keyboard in order to force people to use the mouse. 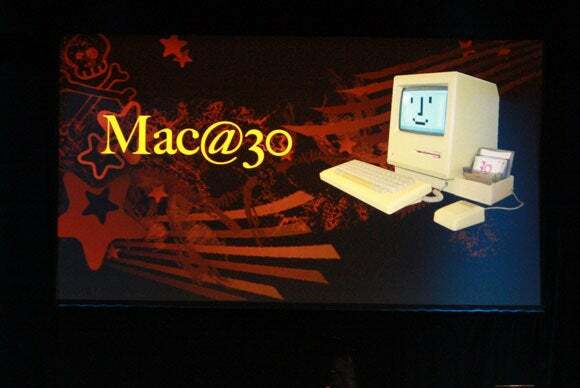 Members of the original Mac development team gather on stage for a group photo. At the end of the second panel, Mike Marukkula came out with a speech to honor the Mac team. 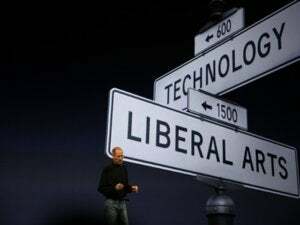 Markkula, known as Apple employee number three, was then honored with a statue of six hands holding up a Mac and an inscription that read, “Apple and Macintosh would never have happened without you. 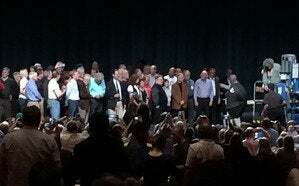 Your participation changed the world.” The members of the Mac team in attendance then took to the stage to pose for a photo. 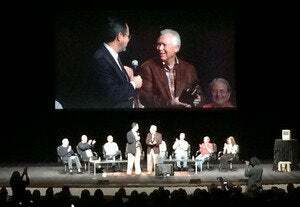 Mike Markkula was presented with an award to recognize his contributions to the development of the Mac. The rest of the event featured a look at Apple’s advertisments by Steve Hayden, a copywriter for the 1984 commerical and other Apple ads; and a panel of third-party software developers who shared their stories on how they started their businesses on the Mac. Your early family really loved you...they had a lot of fun being pirates and worked very hard together before you were born. Your list of accomplishments is truly astounding! We are very, very proud of all the tasks you have mastered...many more than we had ever imagined. Never forget that your parents wanted you to always be respectful of the individuality of your users...and we hope that you will continue to help them communicate their uniqueness to each other. Finally, don’t forget to keep your sense of humor! True artists not only ship... they laugh! Don’t forget about that little Mac Man that used to run across the Desktop every once-in-a-while! 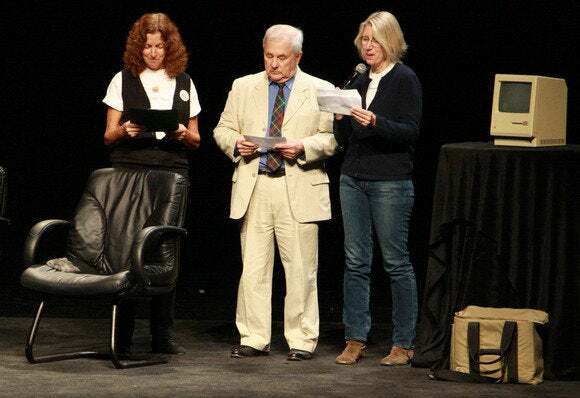 (Left to right) Caroline Rose, Jerry Mancock, and Patti Kenyon read a letter of birthday greetings to the Macintosh.